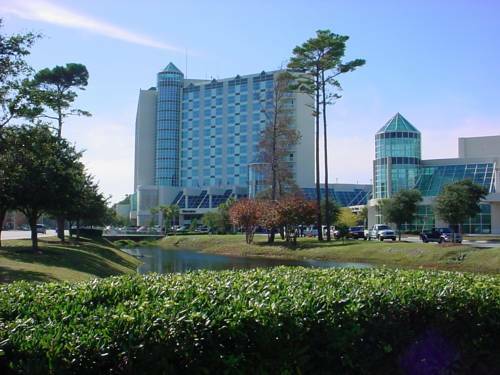 Experience the perfect getaway at Sheraton Myrtle Beach Convention Center Hotel. Located in downtown Myrtle Beach, S.C., our boutique hotel is two blocks from the beach and offers a direct connection to the Myrtle Beach Convention Center. Spread out in our spacious rooms and suites, boasting plush Sheraton Signature Beds, deluxe amenities and floor-to-ceiling windows. Stop by our full-service hotel restaurant, Vidalia's, for delicious cuisine or unwind in our lobby bar. Break a sweat in our Sheraton Fitness Center, take a dip in our indoor heated pool, relax in the whirlpool or lounge on our sundeck. Rejuvenate with spa services. Enjoy our Link@Sheraton lobby work area with complimentary Wi-Fi. If you're in downtown Myrtle Beach to host an event, you'll be delighted with our 250,000 square feet of modern meeting and event space. Explore nearby Broadway at the Beach, Myrtle Beach Sports Center, Carolina Opry, the Boardwalk and golf courses. Discover the best of downtown Myrtle Beach at our boutique hotel. Coffee & Cream: Start your day off right at Coffee & Cream in downtown Myrtle Beach. Our coffee bar menu showcases Starbucks coffees, bagels, grab-and-go snacks and more. Stop by our inviting shop before heading out for a meeting, sightseeing or shopping. Vidalia's: Discover our full-service restaurant in downtown Myrtle Beach, SC. Enjoy homestyle cooking in our casual restaurant, boasting an open-kitchen design so you can see our chefs at work. We also offer two private dining areas - the Tides and the Patio. M Bar: Join us for a cocktail and a light bite at M-Bar, our atrium lounge, here in downtown Myrtle Beach, SC. Relax and enjoy the stunning city views from our contemporary open-glass design lobby bar. Host a private event with us for up to 150 guests.